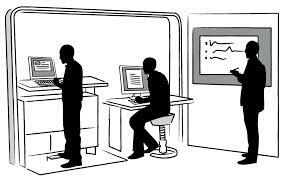 I’m not yet ready for a standing desk, but I am being more conscientious about frequently getting up and walking around throughout my workday. It’s a start! I would love to have the space to set this up, I hate to sit too much, but when you have a lot to do on the computer, the standing work station would work well. One Virtual Assistant built a desk that attached to the wall. it was really like a large shelf at standing height. I can use a box that I put on my desk and to hold my computer when I want to change by sitting desk into a standing desk.